I missed L.A.’s first CicLAvia event last October because I was roaming the streets of some of Europe’s great cities including London, Paris and Amsterdam. What makes those Old World cities a welcome respite from L.A. is more than just their history or cultural institutions – it’s the liveliness found walking their streets. There is a constant sense of discovery and pleasure that’s found in the nooks and crannies of those cities – be it in the architecture, the natural environment or the people who inhabit them. It’s a basic, almost carnal sensation – a constant reminder that the invention of civilization was a pretty good idea. And it’s a feeling that I’ve rarely experienced in L.A. Until yesterday. The police were just doing their job to keep everyone safe as the cars returned to the streets. But it served as a depressing reminder of the hierarchy of priorities here in L.A. and many other American cities. Cars own the streets. Everyone else is literally pushed to the curb. 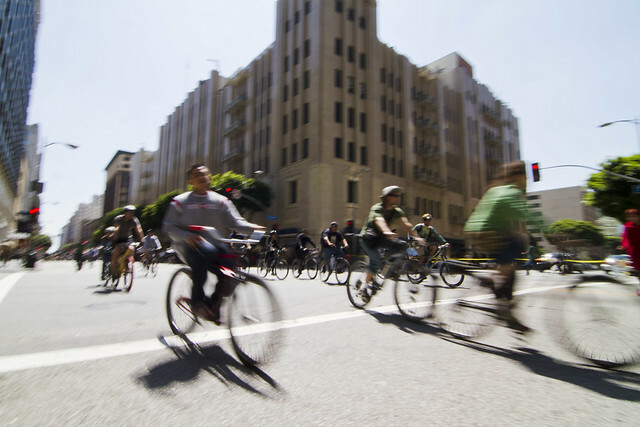 The success of CicLAvia proves that it doesn’t have to be this way and that the hierarchy is wrong. 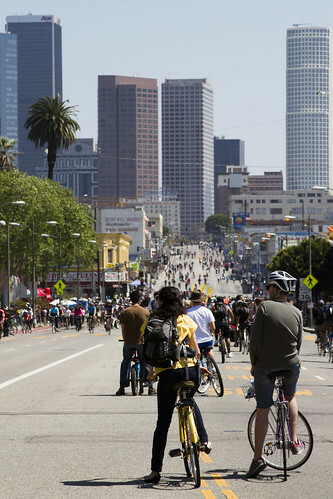 Over 100,000 people took to the seven-mile route yesterday on bike, foot, skateboard, rollerblade, stroller and other contraptions that aren’t spelled c-a-r.
Did the world end because seven miles out of the countless miles of surface streets in L.A. were closed off to cars (save for 13 intersections)? Of course not. And I imagine if 100,000 cars took to that seven mile route yesterday there would be a lot more grimacing and cursing than the smiling camaraderie I witnessed. Cars aren’t the enemy – after all, the great cities of Europe have cars aplenty – but prioritizing them above all else is. We need to have an equitable mode split where cars, transit, bikes and pedestrians each get a fair share of our streets. Some may say “but most people drive cars, so it’s only fair that they get most of the streets.” To that I say: cars also take up the most space, consume the most resources and do the most damage. This unforgettable poster from Muenster, Germany is a reminder that cars require far more space per person that other modes – and in an urban environment space is scarce. When space is scarce it should be used not only for the highest efficiency, but also for the highest quality. It should achieve more than just a single purpose (for example, moving people) but meet multiple goals (including loftier ones like making people happy). I hope CicLAvia continues to grow in popularity and that more Angelenos and civic leaders realize that our streets can and should be shared. Dedicated bike lanes, bus-only lanes, at-grade light rail unimpeded by auto traffic and pedestrian-only streets are all possible if we’re willing to admit that giving cars carte blanche on our streets is not the answer. We’ve tried it and as a result we often have a frustrated populace stuck in traffic. The alternative, which I had a small glimpse of yesterday, is the answer. The good news is CicLAvia is returning in July and again in October, so there will be plenty of chances to experience the alternative L.A.